Need Expert Input For Print, TV or Radio? If you’ve got a question, I’ve got an answer! Welcome! I’m Kelly Jayne McCann, Professional Organizer & Clutter Coach. I am passionate about the science of happiness and habit. And the subject of behavioral change, well, I study it like mad! 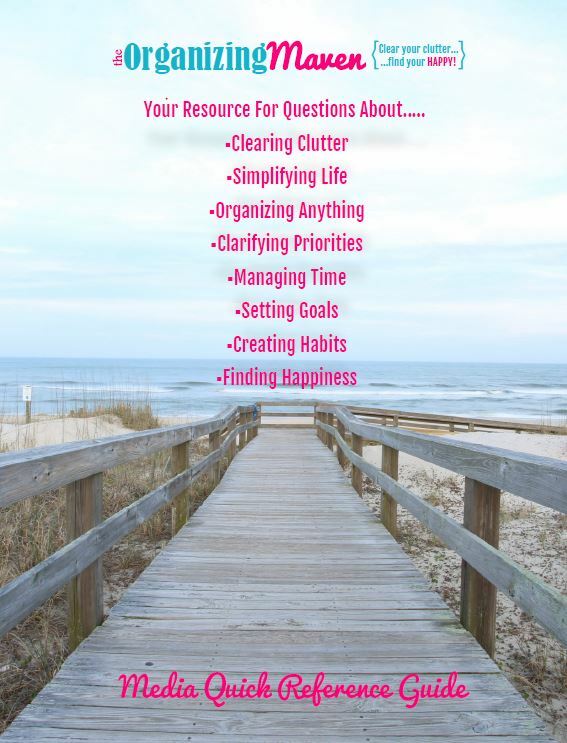 All for good reason – you can’t expect to declutter your life or get organized unless you are willing to modify your behavior and adjust your habits. Along with that, I firmly believe that clarifying priorities is a critical step in the quest for a truly fulfilling and balanced life. Yes, I’m a hold out, I believe in balance. But not in the everything is perfectly even kind of way. I believe we each have to define what balance means for ourselves – it’s about finding meaning and feeling in control. And that meaning, that feeling of control, well those are required ingredients for happiness. Which of course begs the question, what is happiness? I describe it as the deepest level of contentment – your life is feeling good, you’re grateful, you’re working towards goals, you’re satisfied with your progress, and you wouldn’t trade what you’ve got. It’s waking up with excitement at the prospect of a new day, it’s going to sleep feeling deeply satisfied. There’s a joyfulness of spirit and a confidence of heart. What you’re thinking is in alignment with what you’re doing. That’s happiness. Happiness in something everyone wants. That’s where I come in, I help people create lives they love! And I’d love to help you in your work. To make it easy I’ve created a quick reference guide – it’s got the answers to the questions the press most often asks, and it’s got a list of the questions the public most often asks, plus there are additional resources to help you in your research. Download it here. While I absolutely love answering questions, I also know that sometimes it’s nice to have immediate access to answers, so I created a quick reference guide. Feel free to quote from it or use it as jumping on point for a conversation. I hope you find it helpful. You are welcome to contact me directly – I would be thrilled to answer your questions, participate in an interview, contribute to your publication/blog or be a guest on your show!